Sean here with an Inside Pop first. Over the course of the past 11 months, despite our love for all things edible, Amita and I have never covered anything food related on Inside Pop. 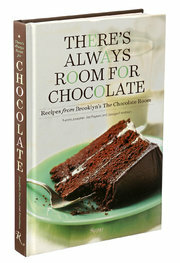 Well, that’s about to change as I #BigSell you an amazing new cook book called, There’s Always Room for Chocolate: Recipes from Brooklyn’s Chocolate Room. There are many things to love about this book. First of all, its origins. Before Brooklyn became the bastion of handcrafted, artisanal preciousness; the dessert cafe, The Chocolate Room opened on 5th Ave in Park Slope Brooklyn and evolved into the epicenter of chocolately deliciousness. A cookbook to help bring their amazing treats beyond Brooklyn borders was inevitable. Secondly, the recipes are easy to follow and give you everything you need to reproduce dishes like The Brownie Sundae, Chocolate Peanut Butter Salted Cookies and a classic Chocolate Cream Pie. The New York Times sings the book’s praises in a recent review. And finally, the editor. Full disclosure I’m married to the man who helped shape this great book. So although I may not be completely objective, I can attest to the attention, effort, artistry and care that was put into creating this wonderful new cookbook. Check it out at your local bookstore or order it here on Amazon. We have 10 more days of #BigSell30; 10 more chances to discover and experience one new piece of pop culture every day during the month of October. Follow us on Twitter @popinsiders for daily recommendations and to share your choices and experiences. Don’t forget to use the hashtag #BigSell30.